"The conventional way to measure graduation rates is to examine how many students complete a degree within 150 percent of the expected completion time—that is, six years for a bachelor’s degree and three years for an associate degree. Using this metric, research suggests that about only half of students enrolled at four-year colleges and universities graduate within 150 percent of the expected completion time, and the completion rate is even lower for students enrolled at two-year colleges." Here's a table from her paper showing college completion rates across different types of institujtions by this measure. Sarah Turner's essay offers some additional in-depth background. On the horizontal axis, these graphs show spending per student. 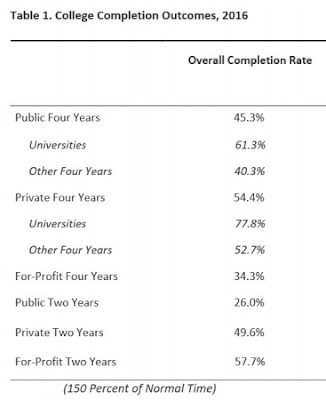 On the vertical axis, they show completion rates (again, as measured by completing a degree within 150% of the expected time) Each dot is a college or university. The central insight is that there is a very wide range of completion rates across schools in the same category that spend much the same amount per student. "In 43 four-year public schools, the three-year cohort default rate is greater than the completion rate. This is also the case for 147 four-year private nonprofit schools and 98 for-profit schools. In other words, students in these schools who borrow face a greater likelihood of defaulting than completing a degree. It would seem, then, that college attendance at these schools leaves many students worse off—lacking a degree, defaulting on a student loan, or both." The papers tend to be stronger on describing the problem than on providing clearly workable solutions, but that's the nature of this issue. College completion rates have been low for a long time, but with the cost of college now having climbed so very high, the issue has a new relevance. For example, Destin looks at how improvements in the psychological environment at a school, including elements of teaching and campus life, can help. Chingos emphasizes that students need preparation to be ready to do college-level work. Turner discusses the pros and cons of linking college completion rates and the levels of state support and financial aid. Schneider and Clark summarize reforms that have improve completion rates at certain schools. One challenge here is to remember that the ultimate goal isn't to punish schools with low completion rates (although that may be necessary in some cases). It's to have fewer students falling off the path to college completion. Homeownership rates in the US rebounded a bit in 2017, but remain near historically low levels. This is a source of concern for a number of reasons: homeownership is a savings vehicle that has worked for a number of households over time; being a homeowner encourages people to look after and contribute to their neighborhoods; and homeownership is part of that loose vision of the good life sometimes called the "American dream." I'll draw on evidence presented in The State of the Nation's Housing 2018, the 30th version of an report produced annually by the Joint Center for Housing Studies of Harvard University. For those who want an overview of US housing markets, including issues of rental markets and low-income affordability, it's a good place to start. Here, I'll focus on homeownership patterns. 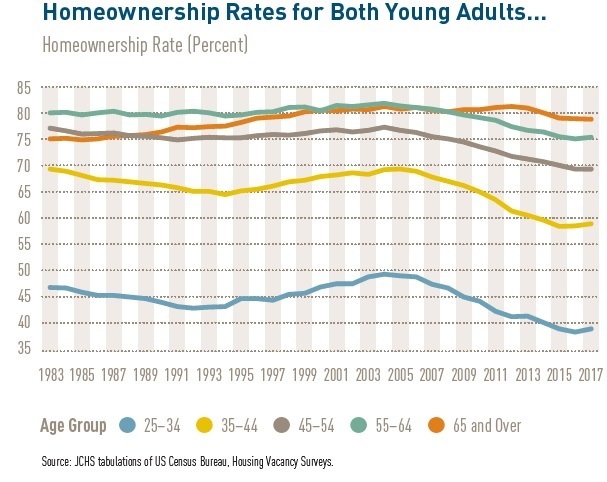 As a starting point, here are a couple of figures showing homeownership by age and by race/ethnicity. 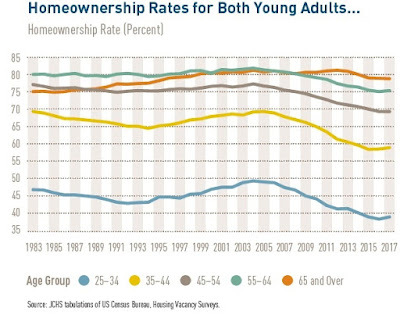 After the peak of prices in the housing market back around 2006, the rate of homeownership doesn't change too much for the over-65 age bracket--many of whom were presumably already well-settled into homeownership many years before 2006--but drops visibly for every other age group. The biggest drops are for the younger age groups. 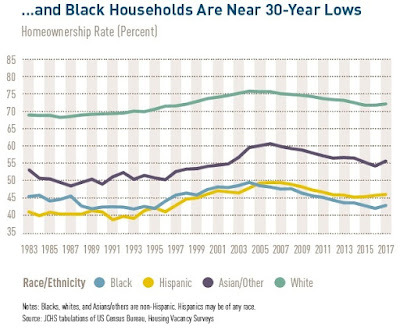 Homeownership drops for every racial/ethic group, as well. 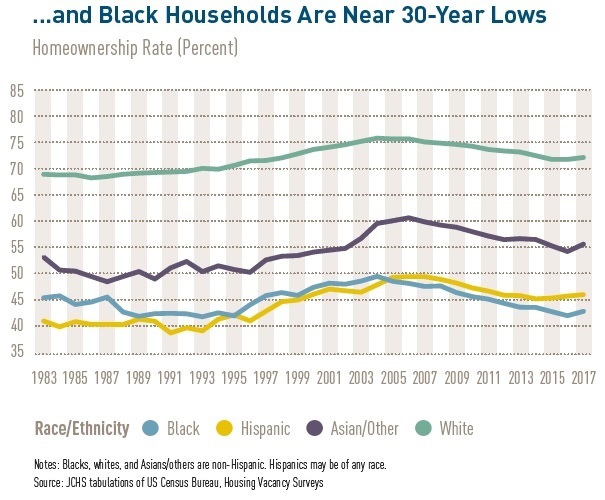 But for blacks in particular, the drop is severe enough that homeownership rates are near their low point for the last four decades. "In 1988, when the first State of the Nation’s Housing report highlighted historically high homeownership costs, the national home price-to-income ratio was 3.2, with just one metro posting a ratio above 6.0. In 2017, the national price-to-income ratio stood at 4.2, and 22 metros had ratios above 6.0. So far, however, low interest rates have kept the median monthly payments on a modest home relatively affordable—in fact $250 lower in real terms than in 1988. However, the ongoing rise in both interest rates and home prices may change this. In addition, higher prices mean higher downpayments and closing costs, an even more difficult hurdle than monthly payments for many first-time homebuyers." Limits on the available supply of housing seem to be keeping prices high. "Why inventories are so tight is not entirely clear. CoreLogic data show that the number of owners underwater on their mortgages shrank from more than 12.1 million in 2011 to 2.5 million in 2017, so negative equity should no longer be a significant drag on sales. Still, conversion of 3.9 million single-family homes to rentals in 2006–2016 could be constraining the number of entry-level homes on the market. The ongoing decline in residential mobility rates may also play a role, with fewer households putting their homes up for sale each year. "Another factor is the low level of single-family construction. Despite six consecutive years of increases, single-family starts stood at just 849,000 units in 2017, well below the long-run annual average of 1.1 million. Indeed, only 610,000 single-family homes were added to the stock annually in 2008–2017. Limited new construction may hold back existing home sales by reducing the tradeup options for current owners, deterring them from putting their own homes on the market. "The slow growth in single-family construction reflects in part homebuilder caution following the dramatic housing bust. But risk aversion aside, a significant constraint on new residential construction may be the dwindling supply of buildable lots. According to Metrostudy data, the inventory of vacant lots in the 98 metro areas tracked fell 36 percent in 2008–2017. Indeed, 21 of the nation’s 25 largest metros reported inventories that would support less than 24 months of residential construction. "Along with limited land, respondents to builder surveys cite rising input costs as adding to the difficulty of constructing entry-level homes. As a result, the share of smaller homes (under 1,800 square feet) built each year fell from 50 percent in 1988 to 36 percent in 2000 to 22 percent in 2017." The US homeownership rate has turned up just a bit in the last year or so, after hitting a 50-year low in the second quarter of 2016. But if the US believes that a higher homeownership rate is a valuable public policy goal, the challenge seems to be to find governing rules for the housing market so that it is profitable for builders to construct a greater quantity of housing, especially at lower and moderate price ranges. "Like it or not, we got married to the Germans, and the Germans got married to the Spaniards. We need to make this work, because breaking up now would be way too costly. What we need is a reform of the euro. In terms of incentives, you need to tell countries that they will not face economic crises alone, that there is going to be money from the European Union that will help the Netherlands going through a rough patch in the same way that federal taxes and transfers will help if California suffers a bad period. That would imply, for instance, moving toward a bigger European Union budget and creating some European bond system. There is a lot of discussion among European economists about how to design such a thing. But there also need to be constraints. For this to be sustainable, fiscal discipline and cleaning up the house really needs to be done. There has to be a great bargain between those who point out the need for making financial and economic crises easier to go through and those who emphasize that, in the long run, rules are very important. That’s the big question mark: Is the political process within Europe going to be able to deliver that solution?" 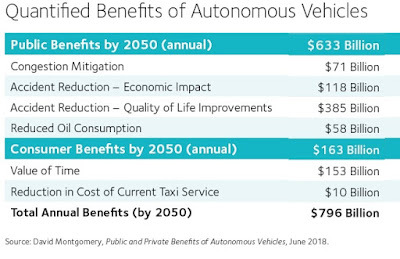 "In the mid-1990s, we learned as a profession how to build models that are dynamic, that take the randomness of the economy seriously, and that incorporate price and wage stickiness. That class of models started being called DSGE, which is the terribly unsexy Dynamic Stochastic General Equilibrium acronym. I think these models really clarify a lot of aspects of, for instance, how monetary policy interacts with aggregate activity, and we learn a lot from them. "Many of the people who are currently very critical of macro are in another generation, and some of them may not be fully aware of where the frontier of research is right now. They also have plenty of free time, so it’s much easier for them to write 20 pages of some type of exposé, if they want to use that word, on the state of macro. This raises a more general issue of whether academia in general and the economics profession in particular have the right incentives to transmit some of these learnings from the frontier to the general public." "Let me give you an example of what the particle filter does. In early 2018 we entered a time of high volatility in the stock market. The problem with volatility is that it is not directly observed: I can go to the back pages of the Financial Times and find a value in the table for a stock’s price, but there is no number to express its volatility. What you need is a statistical model that will let you learn about volatility from things you can actually observe, in this case, the variations of the stock market from one day to the next. This is called filtering — learning about things that you haven’t seen from things you can see. "The original filters were developed for the space program. The idea is you are the guy in Houston with a joystick, and you see the satellite but can’t get its exact position because you are measuring with radar and there is noise. What you are trying to figure out is how much to push the joystick to the left or right given what the radar is telling you. 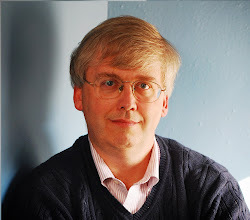 "For the longest time the most important filter was the Kalman filter. 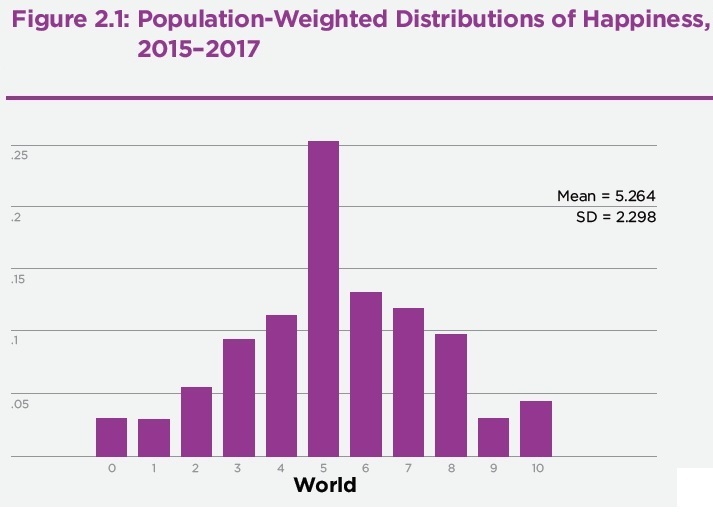 It requires two assumptions: that the world is linear, and that noise comes from a normal distribution, or is `well behaved.' Those assumptions prevent it from handling many, many questions in macroeconomics. The best example is volatility because it can only be positive: You can have a lot of volatility or very little, but you cannot have negative volatility. "So when I was a graduate student, I was very interested in coming up with methods that could extend filtering to these types of environments. I spent a lot of hours browsing through math journals, and I heard about this new generation of methods called sequential Monte Carlo, which is a complex name for something quite simple: A classic question in a basic probability class is if you throw two die, what is the probability that the sum of the two is five. You have to calculate the probability that the first is a one and the second is a four, and so on, and when you do that homework you always make a mistake because you forget one combination. Alternatively, you could throw the dice one million times. Of course, in real life you can’t do that, but computers can do it for you. "In the 1990s, some people came up with the idea of applying Monte Carlos recursively to filtering problems. I learned about these new methods, and I thought gee, this can be done in economics as well. So I came back to my office and got my dear friend and co-author Juan Rubio and I explained to him, `This can work,' and he said, `Yeah.' I said, `Well, let’s write a paper.' So we wrote the paper, my most-cited paper probably, and it still pays for my mortgage." The debate over the extent to which uninsured medical costs lead to personal bankruptcies is interesting for a couple of reasons. In terms of social science, it shows the difference between a naive reading of survey data and an actual research design. In terms of politics, it shows the allure of a more glamorous and striking claim, even when incorrect, over a similar claim that is less flashy but actually true. There's a recent outbreak of this debate in the pages of the New England Journal of Medicine. In the issue of March 22, 2018, Carlos Dobkin, Amy Finkelstein, Raymond Kluender and Matthew J. Notowidigdo have written a short "Perspective" piece called "Myth and Measurement — The Case of Medical Bankruptcies" (pp. 1076-1078). It's a purely verbal article, not a research report, which draws heavily the findings of their article called "The Economic Consequences of Hospital Admissions." which appeared in the February 2018 issue of the American Economic Review (108: 2, pp. 308-52). If you don't have access to the AER online, a final version of the paper in manuscript is here. The Dobkin et al. article is criticizing earlier studies that claimed to show that medical costs were the cause of 60% of all personal bankruptcies in the US. Several of the authors of that work-- David U. Himmelstein, Steffie Woolhandler, and Elizabeth Warren (now a US Senator from Massachusetts)--responded in the June 7 issue of the NEJM (pp. 2245-2246), offer a response, which is then followed by a brief response from the Dobkin et al. group (pp. 22245-2246). "During the push to pass the Affordable Care Act, President Barack Obama often described the “crushing cost of health care” that was causing millions of Americans to “live every day just one accident or illness away from bankruptcy” and repeatedly stated that the high cost of health care “causes a bankruptcy in America every 30 seconds.” Stories of illnesses and injuries with financial consequences so severe that they caused households to file for bankruptcy were used as a major argument in support of the 2010 Affordable Care Act. 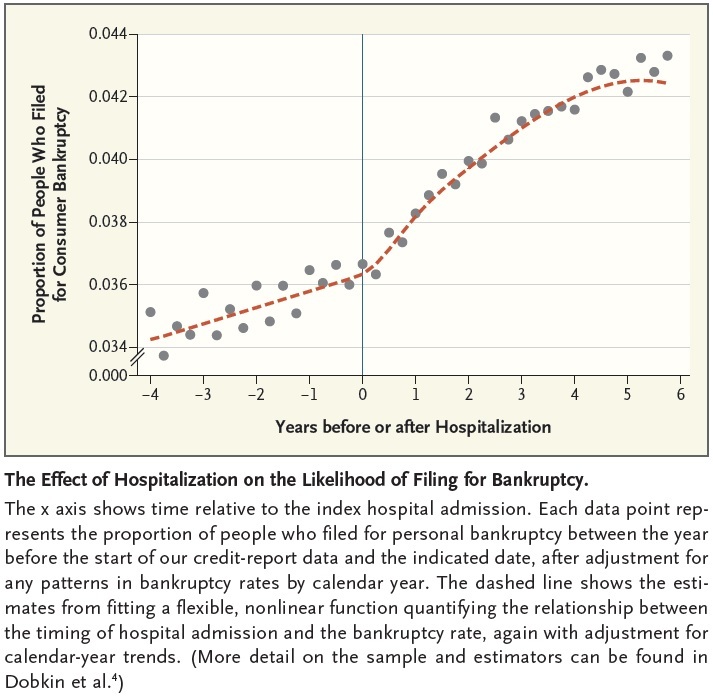 And in 2014, Senators Elizabeth Warren (D-MA) and Sheldon Whitehouse (D-RI) cited medical bills as “the leading cause of personal bankruptcy” when introducing the Medical Bankruptcy Fairness Act, which would have made the bankruptcy process more forgiving for “medically distressed debtors.” But it turns out that the existing evidence for “medical bankruptcies” suffers from a basic statistical fallacy; when we eliminated this problem, we found compelling evidence of the existence of medical bankruptcies but discovered that medical expenses cause many fewer bankruptcies than has been claimed." "Himmelstein et al. argue that if bankruptcy filers are asked what caused their bankruptcy, a large share will say medical expenses. But their approach is not a credible way to estimate the causes of bankruptcy. It is akin to asking patients with cardiac disease what caused their heart attack; they probably do not know whether it was poor genes, poor diet, stress, or other factors. A related problem is social desirability bias, which makes it hard to take at face value explanations reported by the bankruptcy filers. Causal estimates require isolating a potential cause and its effect on the outcome of interest." That last sentence might be engraved over the doorways of econometrics computer labs everywhere. The results of one of the many statistical tests that Dobkin et al. carry out in their AER article is reported in their NEJM comment. They look at data on half a million people who are admitted to hospitals in California over a four-year period. 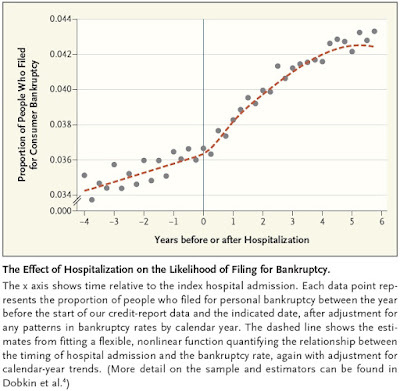 They find that those admitted to the hospital do have a higher chance of bankrupcy, as shown in this figure. But when they scale up this estimate to the US population, they find that health care costs are responsible for about 4% of bankruptcies, not 60%. Of course, this estimate is just one piece of evidence. The Dobkin et al. group are scrupulous in pointing out that one also should look at data on people outside of California, at costs of health care not linked to hospitalization, and so on and so on. But they also point out that such factors are pretty unlikely to raise the share of bankruptcies caused by health care costs from 4% to 60%. "Our findings suggest that non-elderly insured adults still face considerable exposure to adverse economic consequences of hospital admissions through their impact on labor earnings. ... Taken together, our findings underscore the nature of insurance, and the lack thereof, in the United States. Our estimates suggest that in the first few years, the total medical expense and earnings consequences of a hospital admission are similar for insured adults and that over a longer horizon the earnings consequences loom relatively larger. By design, insurance in the US covers (a large portion of) medical expenses but relatively little of the earnings decline. Employer provision of sick pay and private disability insurance is fairly sparse, and public disability insurance is available only after a lengthy application and approval process (Autor et al. 2015). By contrast, in many other countries, there is substantially more formal insurance for the labor market consequences of adverse health." Thus, the Dobkin et al. group are agreeing that a period of poor health and high health care costs can be a serious economic burden--but pointing out that the burden often results more from a loss of labor income than from the actual health care costs. As a result, improved insurance for health care costs would be only a very partial fix. And improved health care insurance would have only a very small effect on the total number of bankruptcies. In their response, the Himmelstein et al. group repeats the various caveats that the Dobkin et al. group has already noted about their study. And at the end, the Himmelstein et al. group tosses in this comment: "Characterizing debtors’ self-reports as “myth” is demeaning to people struggling with health care costs ..."
Of course, it's not the debtors or their self-reports that are being called a "myth." The myth is in the causal interpretation that was being being placed on that data. This style of argument is essentially: "If you don't agree with my interpretation of data, then you are being demeaning toward people in need." When someone resorts to that form of illogic, it's a fair inference that they are losing the argument. Moreover, this corporate borrowing has two new traits. One is that as bank regulators all over the globe have tightened up, this rise in corporate borrowing tends to take the form of bonds rather than bank loans. 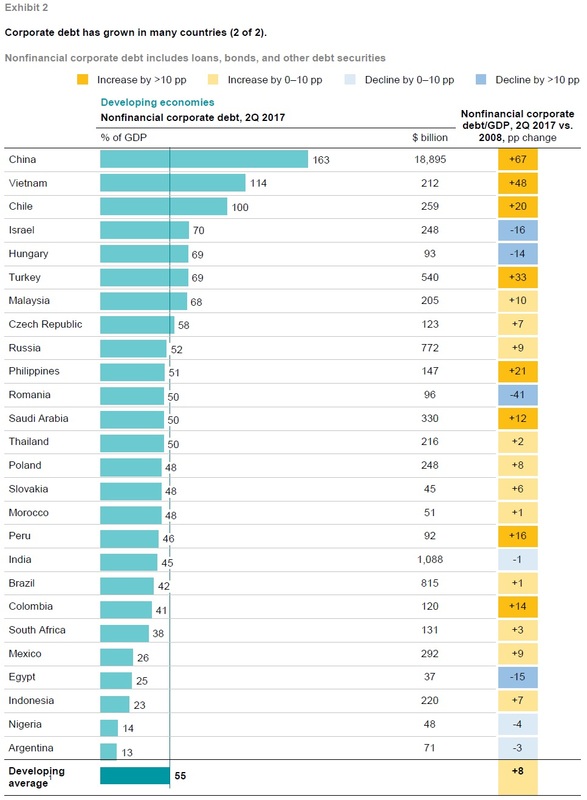 The other interesting trait is that this rise in corporate borrowing around the world can be traced back to developing economies--and especially to China. "A relatively new feature of the debt landscape in recent years has been a shift in corporate borrowing from loans to bonds. Given the growing pressure on banks to meet new capital and liquidity standards, global nonfinancial corporate loans outstanding have been growing by only 3 percent annually on average since 2007 to stand at around $55 trillion in 2017. However, the share of global corporate debt in the form of bonds has nearly doubled, and the value of corporate bonds outstanding has grown 2.7 times since 2007. This is a positive trend, leading to a diversification of corporate financing. However, we also find risks." 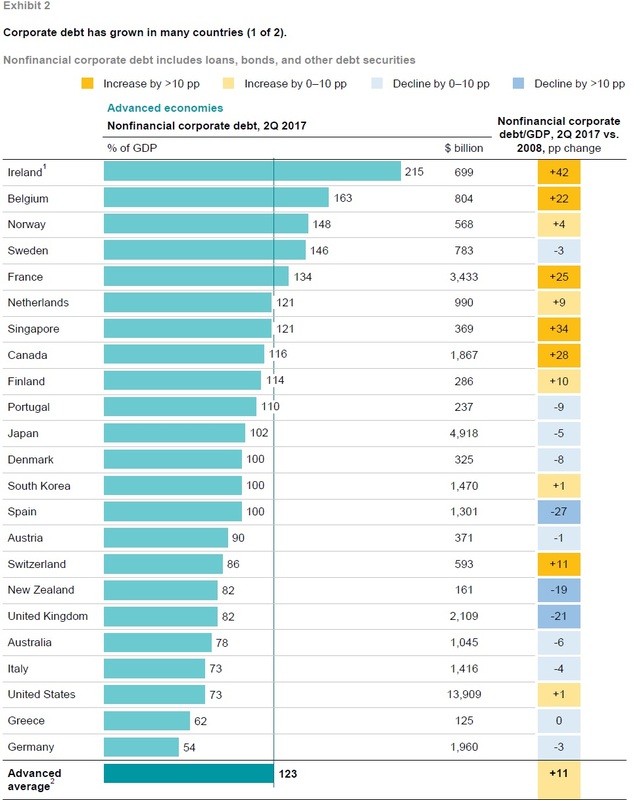 Here are a couple of summary figures for nonfinancial corporate debt by country. The countries are ranked by total corporate debt as a share of GDP: top panel shows advanced eoconomies, the bottom panel shows developing countries. The tables then also list the total corporate debt in each country and how it has risen or fall in the last decade. "The value of China’s nonfinancial corporate bonds outstanding increased from $69 billion in 2007 to $2 trillion by the end of 2017, making China one of the largest bond markets in the world. In developing countries other than China, corporate bonds outstanding have also grown, although at a more measured pace of 14 percent a year, from $313 billion in 2007 to $1.2 trillion in 2017 ... Growth has been particularly strong in Brazil, Chile, Mexico, and Russia. "While in China 95 percent of corporate bonds outstanding are denominated in the local currency, in other developing countries that is not the case. Historically, nearly all companies in developing economies issued bonds in foreign currencies because investors would not take the risk of buying bonds in local currencies. However, over the past decade, larger local-currency bond markets have developed. Still, roughly two-thirds of corporate bonds in developing economies maturing annually are denominated in US dollars and other foreign currencies. This creates additional risk, because debt service costs will soar if the local currency depreciates (and the company does not have revenue streams in the foreign currency)." On the wave of companies that are going to want to refinance bonds. The report estimates that in China, India, and Brazil, as much as 30-40% of all bonds could risk default if interest rates rise. "As a bond matures, companies have two choices: to repay the principal amount borrowed, or to issue a new bond to replace the maturing one. Historically, companies issued long-term bonds for project finance and repaid the debt once due. Today, however, most borrowers seek to refinance maturing bonds by issuing new ones. From 2018 to 2022, a record amount of bonds—between $1.6 trillion and $2.1 trillion annually—will mature. Globally, a total of $7.9 trillion of bonds will come due during those five years, based on bonds already issued. However, some bonds have maturities of less than five years and may still be issued and come due during that period. If current issuance trends continue, then as much as $10 trillion of bonds will come due over the next five years ... At least $3 trillion of this total will be from US corporations, $1.7 trillion from Chinese companies, and $1.7 trillion from Western European companies. Rising interest rates could make it more difficult for many borrowers to refinance their debt." I don't have a good sense of whether all this is real cause for alarm, or just a blip in the road. But it does seem to me that in the last few years, with a combination of very low government interest rates and tighter restrictions on bank lending, there has been a lot of eagerness by investors to "search for yield" in corporate bond markets. It wouldn't be startling to find that a share of those investors have not taken appropriate care to hedge the risks involved. Douglas Clement has an "Interview with Marianne Bertrand," subtitled "University of Chicago economist on the glass ceiling, implications of growing inequality and the trouble with boys" (The Region, Federal Reserve Bank of Minneapolis, online June 19, 2018). Here are a few of the comments that especially stuck with me, but there's more at the interview. "This was item number one in the paper. 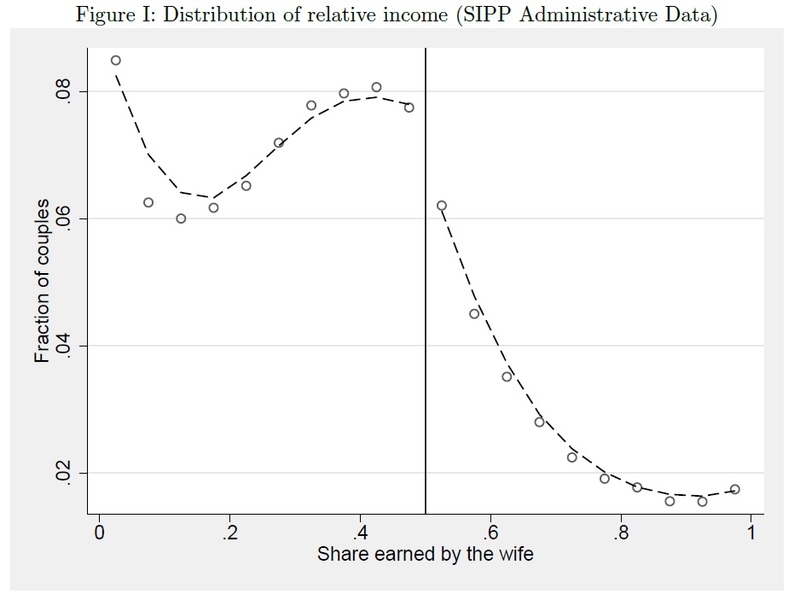 Let’s do something very simple: Look at the distribution of relative income of wife and husband within couples. If this norm is important, we should see, quote-unquote, “too few” couples where the wife earns more than her husband. And this is exactly what we found in administrative data; that’s the picture that we’re looking at right there. "And then, in a sense, starting from this picture, we tried to figure out where this could be coming from. One possibility is that those “missing” couples where the wife earns more than her husband may never get formed, meaning that it’s something about the marriage market. ... Another reason why this picture may exist is that those, quote-unquote, “missing” couples were less stable. So they existed, but they were more likely to break down. And we also found evidence of that in the data. 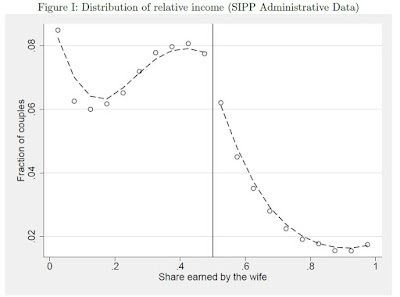 Looking at couples where the wives earn more than the husbands, we found signs of more marital instability, more marital unhappiness and some signs that these couples were more likely to end up in divorce." "I like to use the example you mentioned, social mobility. Suppose we work at the same company. You are my boss. I’m your employee. You’re from the top of the income distribution, and I’m from the bottom. My ability to move up in the company might be a function of how much you connect with me, and connecting with one another might be a function of the quality of the conversation that we can have around the water cooler. Did we do the same thing over the weekend? Do we watch the same shows? Do we have the same hobbies and eat the same food? "So we tried to assemble all the data sets we could; for example, time-use data, which go back to the 1960s. 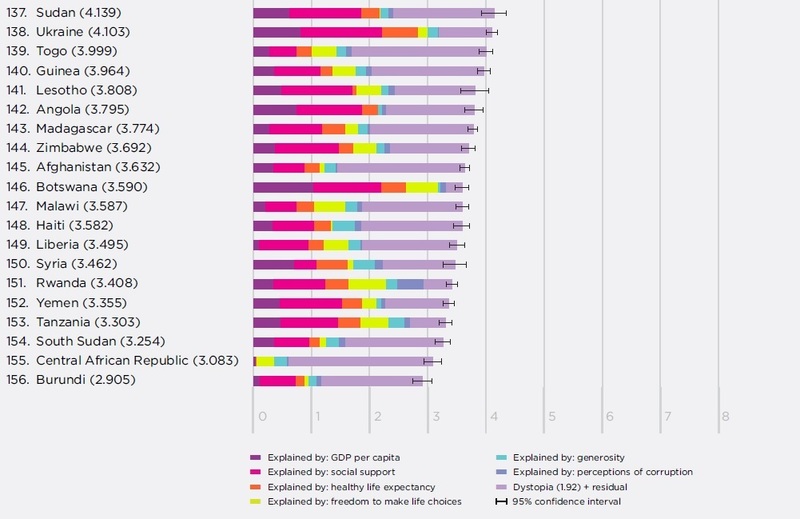 Another data set that a lot of social scientists use is the General Social Survey, which tells us something about views and opinions—views on abortion, gays, racial issues, government spending and the like. ... [W]e had access to a marketing data set, which is truly remarkable. In that data set, we can see media consumption—what TV shows people watch, what movies they watch, what magazines they read. The data set also shows thousands of products that people may or may not buy, and thousands of brands that people may or may not buy or own. "[N]ow we’ve done this exercise, as I said, for race, gender and urbanicity. When we first got these results on income, people said, especially in the context of the recent election, “Well, income is not the important one; it’s urban/rural. That’s the important divide in America.” We’ve also done it based on political attitudes, and the main result, which I just gave you for income—there’s no big trend—essentially applies to, at a first-level of approximation, everything that we have looked at. "The one really large exception quantitatively is our ability to predict whether someone is liberal or conservative/Democrat or Republican based on their social attitudes. That has been increasing over time. So liberals and conservatives haven’t been diverging over time on TV consumption, brands or goods, but on social views they have been diverging a lot over time. "The results were surprising to us. We went into this with in the back of our mind the discussion that’s happening right now [that Americans are increasingly divided along economic and other lines], and we really thought that we were going to see signs of that in the data. "How do I rationalize the results? It’s not clear, but here’s one thought when it comes to products and brands. I think today we think you can easily see who is rich or poor because rich people own an iPhone and poor people don’t; but, then, 25 years ago, it was whether you owned a DVD player that separated rich and poor. 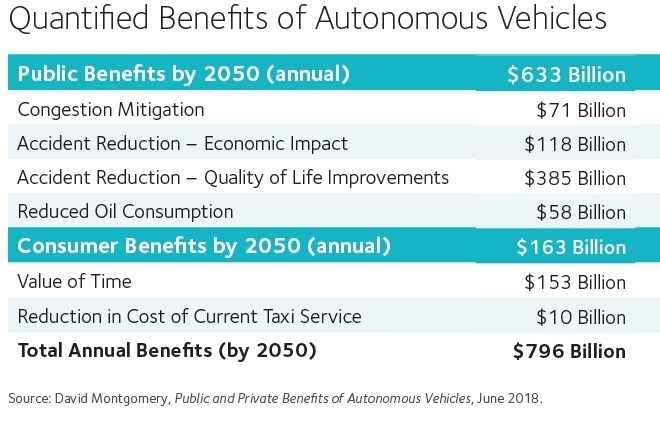 There are waves of technological changes—the rich, the more educated are always going to be the early adopters of those—but there are constant waves of technological change." "[T]he gender gap in noncognitive skills is particularly large in broken families. And that term can mean many different things. It’s low income, it’s absent fathers, it’s less education, it’s fewer parental inputs. ... If you have boys doing more poorly in broken families, that means that a lot of these boys become less marriageable. That means more single moms and more broken families in the future and hence, again, more boys growing up in conditions where they may not get the kind of parenting that could address whatever deficiencies they have in noncognitive skills. ... One argument we make in the paper is that boys may be born at greater risk of having noncognitive problems than girls. ... And if that’s true, then it’s particularly important to have stronger parenting for boys than girls in order to correct this deficit. But, again, that’s highly speculative." Richard Thaler won the Nobel Prize in economics in 2017 "for his contributions to behavioural economics. He tells the story of how the field evolved from early musings through small-scale tests and more comprehensive theories and all the way to public policy in his Nobel prize lecture, "From Cashews to Nudges: The Evolution of Behavioral Economics." It is ungated and freely available in the June 2018 issue of the American Economic Review (108:6, pp. 1265–1287). Video of the lecture being delivered is here. At a dinner party for fellow economics graduate students I put out a large bowl of cashew nuts to accompany drinks while waiting for dinner to finish cooking. In a short period of time, we devoured half the bowl of nuts. Seeing that our appetites (and waistlines) were in danger I removed the bowl and left it in the kitchen pantry. When I returned everyone thanked me. But, as economists are prone to do, we soon launched into analysis: how is it that we were all happy now that the nuts were gone? A basic axiom of economic theory is that more choices are always preferred to fewer—because you can always turn down the extra option. The chair of the University of Rochester economics department (and one of my advisors), Richard Rosett was a wine lover who had begun buying and collecting wine in the 1950s. For as little as $5, he had purchased some choice bottle that he could now sell to a local retailer for $100. Rosett had a rule against paying more than $30 for a bottle of wine, but he did not sell any of his old bottles. Instead he would drink them on special occasions. In summary, he would enjoy his old bottles worth $100 each, but he would neither buy nor sell at that price. Therefore his utility of one of those old bottles was both higher and lower than $100. Impossible. My friend Jeffrey and I were given two tickets to a professional basketball game in Buffalo, normally a 75-minute drive from Rochester. On the day of the game there was a snowstorm and we sensibly decided to skip the game. But Jeffrey, who is not an economist, remarked, “If we had paid full price for those tickets we would have gone!” As an observation about human behavior he was right, but according to economic theory sunk costs do not matter. Why is going to the game more attractive if we have higher sunk costs? For an economist, each of these stories suggests a departure from purely rational behavior. More important, it suggest that the departure from rational behavior is in some way understandable, plausible and predictable as a matter of human psychology. By understanding the rules of thumb (or "heuristics") that guide such behavior, one can build a branch of economics. For example, the cashew story describes the issue that people can sometimes lack self-control, in the sense that they give in to short-run temptations even when say that they would prefer not to do so. As Thaler says, there is a "planner" and a "doer" inside each of us--and they are not always in synch. As a result, people look for self-control devices (like moving the cashews out of the room), to help them act in the way that they wish to do, but seem incapable of actually doing. One can immediately think of applications of this framework in retirement plans to help us save, diet plans to help us eat healthier food, exercise clubs and plans to get us moving, book clubs so we read something worthwhile every now and then, and more. The wine story is an example of what Thaler would later come to call "the endowment effect" or "status quo bias." People often seem to have a bias to holding on to what they have, in part because the fear of that change will incur a loss is bigger than the lure that change will incur a gain. An interesting application here is that many people will have a tendency to stick with what they've got, even if they learn more about alternatives that might be better: the same quantity of savings in a retirement plan and the same way of investing those savings, the same insurance policies with the same levels of deductibles, and so on. People may originally make a choice for no particular reason--perhaps it was just the default option at the time--but then they become more likely to stick with that default option in the future. If a firm or the government changes the default options, it can also change behavior in a lasting way. "When a family spends $100 to buy tickets in advance of some event, the purchase will not create either pleasure or pain so long as the price is equal to the expected price. However, if there is a snowstorm, there is a $100 purchase that now has to be “recognized” and it will then be experienced as a loss. This helps explain why someone can think that going to the event is a good idea—it eliminates the need to declare the original purchase as a loss. ... When I was thinking about these issues, the United States government’s continued involvement in the Vietnam war seemed best explained in these terms." Conversely, when Thaler and his friend were given tickets as a gift, not using the tickets was not perceived as a loss in the same way. This unwillingness to face losses, even when they are sunk costs in the past, shows up in a number of settings: for example, the way in which investors are more likely to continue holding stocks that have declined in value, hoping they will rise again, while being more willing to sell stocks that have risen in price. "When we were looking for a publisher for the book we found the reaction to be rather tepid, probably in part because the phrase “libertarian paternalism” does not exactly roll off the tongue. Fortunately one of the many publishers that declined to bid on the book suggested that the word “nudge” might be an appropriate title. And so we published Nudge: Improving Decisions about Health, Wealth and Happiness. In this roundabout way, a new technical term came into social science parlance: a nudge. The book Nudge is based on two core principles: libertarian paternalism and choice architecture. It is true that the phrase libertarian paternalism sounds like an oxymoron, but according to our definition it is not. By paternalism we mean choosing actions that are intended to make the affected parties better off as defined by themselves. More specifically, the idea is to help people make the choice they would select if they were fully informed and in what George Loewenstein (1996) calls a “cold state,” meaning, unaffected by arousal or temptation." Of course, nudges are not just the result of government policies. Instead, we are being nudged all the time, often in ways we don't perceive clearly at the time. Firms can try to use nudges to their advantage, as well, which Thaler nicely describes as "sludge:"
"People have been nudging as long as they have been trying to influence other people. And much as we might wish it to be so, not all nudging is nudging for good. The same passive behavior we saw among Swedish savers applies to nearly everyone agreeing to software terms, or mortgage documents, or car payments, or employment contracts. We click “agree” without reading, and can find ourselves locked into a long-term contract that can only be terminated with considerable time and aggravation, or worse. Some firms are actively making use of behaviorally informed strategies to profit from the lack of scrutiny most shoppers apply. I call this kind of exploitive behavior “sludge.” It is the exact opposite of nudging for good. But whether the use of sludge is a long-run profit maximizing strategy remains to be seen. Creating the reputation as a “sludge-free” supplier of goods and services may be a winning long-run strategy ..."
For those who would like additional doses of Thaler, here are some starting points: links to two interviews and another academic lecture. When the G-7 gatherings originated in the 1970s, the included only finance ministers who typically met with little notice or publicity. They were working meetings. But in the 1980s, they became public events with top government leaders present. As the Council of Foreign Relations has noted, it "The G-7 serves as a forum for highly industrialized democracies to coordinate economic, security, and energy policy." 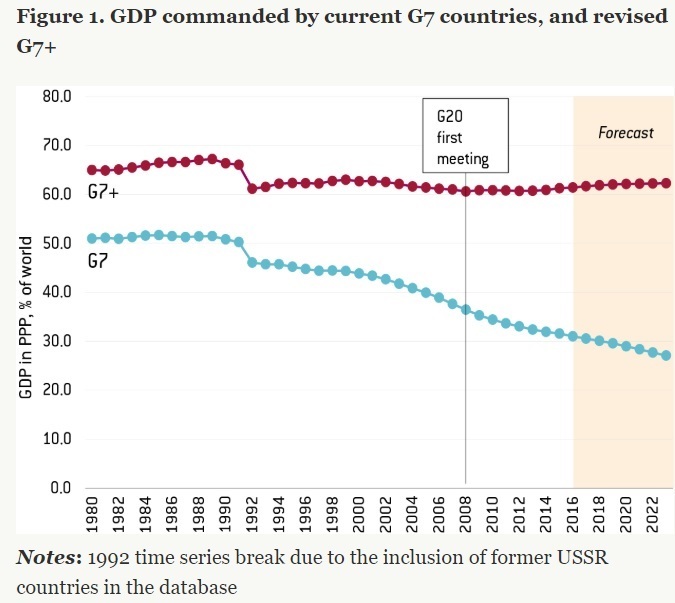 They propose a G-7+, which would cover a more sustained share of world GDP. Basically, Germany, France, and Italy combine into one spot for the euro-zone countries. Canada drops out. This frees up spots to add Brazil, India, and China, while still holding to seven members. They write: "Crucially, the G7+ would provide leadership and fast-paced decision-making on economic and financial issues of global relevance – but should not replace the G20, which remains an important avenue for discussions of all other issues that call for higher representativeness, ranging from terrorism and food security to tax avoidance and climate change." The G-20, for those scoring at home, is a broader group that grew out of the G-7: "The G20 is made up of 19 countries and the European Union. 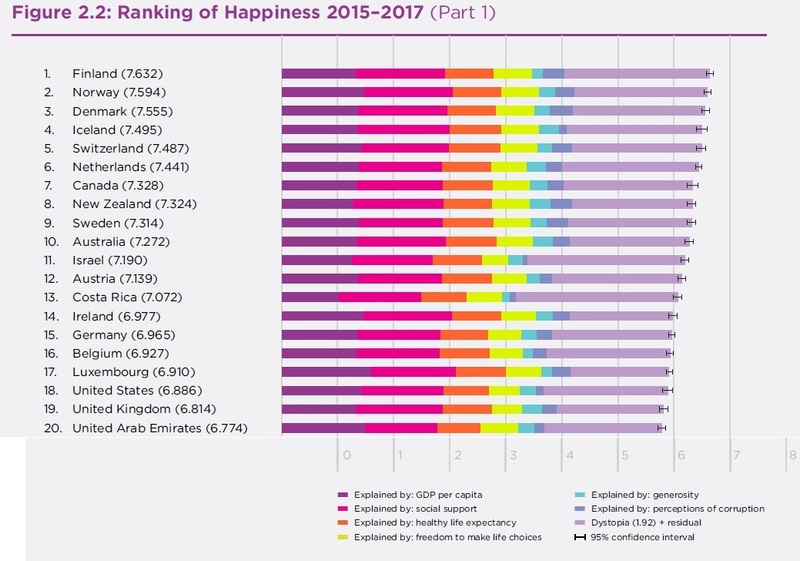 The 19 countries are Argentina, Australia, Brazil, Canada, China, Germany, France, India, Indonesia, Italy, Japan, Mexico, Russia, Saudi Arabia, South Africa, South Korea, Turkey, the United Kingdom and the United States." Communication between countries can be valuable, and regular forums can make that communication flow more easily than continually trying to build new forums. So I'm not exactly opposed to the G-7, or an expanded G-7+, or the G-20. 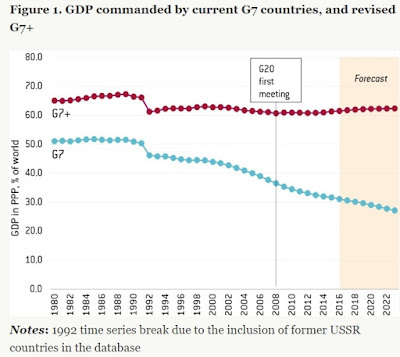 It's certainly useful for the G-7 countries to remind themselves and each other that their global economic and political power is diminishing. But it also seems to me that such groups can easily be taken over by pretentiousness and public relations gestures, and that world leaders might in some cases find their time better-spent in working on problems of their domestic economies. For example, the website of the G-20 proclaims: "In 2008, amidst the global financial crisis, the world saw a need for new consensus-building at the highest political level. Since then, the G20 summits have been attended by heads of state or government, and the G20 was instrumental in stabilizing the world economy." I'd be willing to hear a serious case that "the G20 was instrumental in stabilizing the world economy" through "new consensus-building at the highest political level." But I'm skeptical. Readers who are interested in digging into the ways in which G-7 and G-20 cooperation might influence policy might usefully begin with two essays. Adam Triggs has written "Do Global Forums Influence Domestic Macroeconomic Policies Anymore? Results from In-depth Interview with the World's Leaders, Central Bank Governors, Finance Ministers, and Officials" (Global Economy and Development at Brookings, Working Paper 115, April 2018). Triggs shows persuasively that many world leaders at least claim that summits are useful. On the other side, Stephen Kirchner expresses a high degree of skepticism about the usefulness and effectiveness of these international organizations in "The G20 and Global Governance," which was published in the Cato Journal (Fall 2016, pp. 485-506). Bangladesh has over 160 million people, which makes it the eighth most populous country in the world (just behind Pakistan and Nigeria, just ahead of Russia, Mexico, and Japan). I can't claim that I've been paying close attention to its economy, but I was nonetheless started to see that Bangladesh has shifted (in the World Bank's classification) from being a "low-income" to a "middle-income" country. "The Bangladesh economy continues to perform well with robust and stable growth. GDP growth has averaged more than 6.0 percent over the last decade, significantly lifting GDP per capita. Thanks to the ready-made garment (RMG) sector, the economy has diversified away from an agrarian to a more manufacturing-based economy, supported by abundant low-cost labor. Poverty has declined steadily and other social indicators have improved. 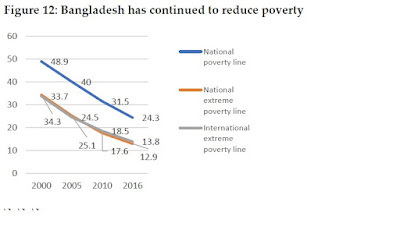 As a result, Bangladesh is now emerging from a low-income to lower-middle income country status. More recently, broadly sound macroeconomic policies have contributed to robust growth, stable inflation, moderate public debt, and greater resilience to external shocks." Let's unpack that a bit. 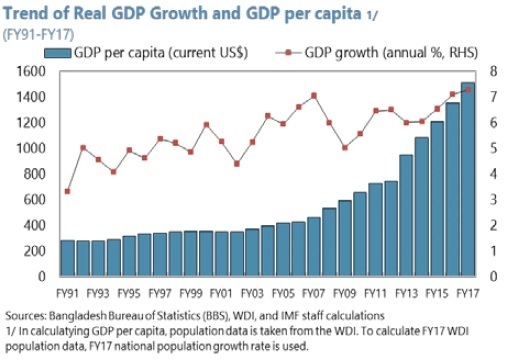 Here's a figure from the IMF report showing per capita GDP (left axis) and GDP growth in Bangladesh since 1991. 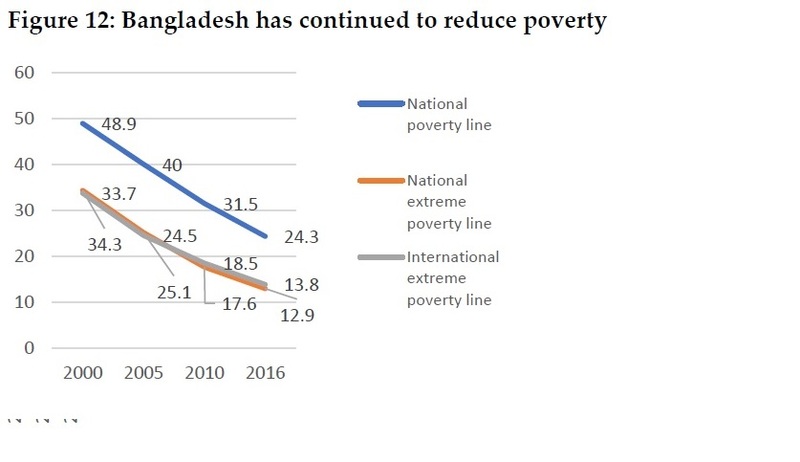 Here's one more from the World Bank showing the corresponding drop in poverty rates in Bangladesh. "Bangladesh also diversified its economy. Much of its early growth came from the ready-made garment industry. It earned its nickname: T-shirt maker to the world. But now, other industries are flourishing as well, including aquaculture and online services. Even the garment industry is diversifying. Along with basic shirts, Bangladesh also produces high-end sportswear that can be found in Europe’s trendiest stores." "One notable point is that the main garment firms in Bangladesh are large—especially compared to those in India, owing largely to different labor laws. All labor markets need regulation. But, in India, the 1947 Industrial Disputes Act imposes heavy restrictions on firms’ ability to contract workers and expand their labor force, ultimately doing more harm than good. The law was enacted a few months before the August 1947 independence of India and Pakistan from British imperial rule, meaning that both new countries inherited it. But Pakistan’s military regime, impatient with trade unions from the region that would become Bangladesh, repealed it in 1958. "Thus, having been born without the law, Bangladesh offered a better environment for manufacturing firms to achieve economies of scale and create a large number of jobs. And though Bangladesh still needs much stronger regulation to protect workers from occupational hazards, the absence of a law that explicitly curtails labor-market flexibility has been a boon for job creation and manufacturing success." Both Basu and Wazed also mention greater gender equity in the workplace and in education as a boost to growth. 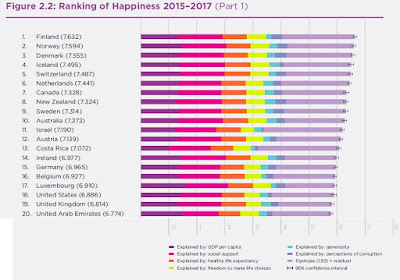 Wazed writes: "The World Economic Forum validated the government’s success in these metrics last year when it ranked Bangladesh first in gender equality among South Asian nations for the second year in a row." When it comes to the workplace, the progress in gender equity seems modest compared with how far there is to go. 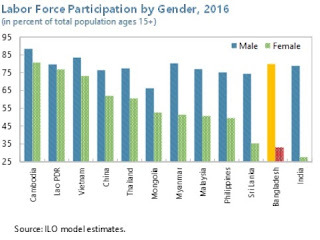 Here's a figure from the IMF showing male and female labor force participation across a range of countries, with Bangladesh highlighted. 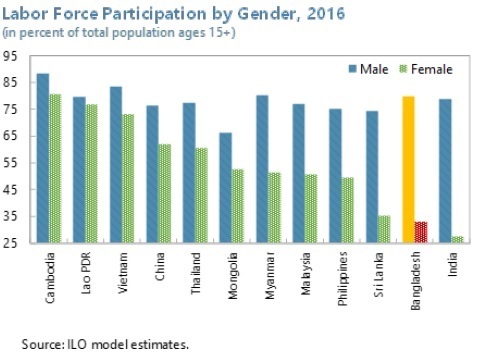 The countries of South Asia have an enormous untapped resource in the possibility of expanding women's labor force participation. "Between 2000 and 2016, Bangladesh’s net enrollment rate at the primary school level increased from 80 percent to 99 percent. Secondary school enrollment also increased from 45 percent to 54 percent. In addition, Bangladesh achieved complete gender parity in primary education, with 99.4 percent of all girls attending school. Eighty-one percent of the students who enroll in first grade now reach fifth grade. As a result, the adult literacy rate hit a 12-year high last year and is expected to climb in the years ahead as access to educational opportunities expand across the country." Finally, Bangladesh has made a real effort to expand access to the financial sector and to digital technologies. Basu writes: "The Bangladesh government also deserves credit for supporting grassroots initiatives in economic inclusion ... Among Bangladeshi adults with bank accounts, 34.1 percent made digital transactions in 2017, compared to an average rate of 27.8 percent for South Asia. Moreover, only 10.4 percent of Bangladeshi bank accounts are “dormant” (meaning there were no deposits or withdrawals in the previous year), compared to 48 percent of Indian bank accounts." Wazed writes: "A country of 163 million people, Bangladesh has more than 145 million mobile phone subscribers, an increase of nearly 59 million in just six years. The adoption of new technologies has led to positive social changes, faster communication and an increased desire for democracy. The government’s “Digital Bangladesh” program has extended internet access and government services to the far reaches of the country." Bangladesh has its share of economic and political challenges, of course. to put growth and employment generation on a healthy and sustainable path." There is the challenge dealing with Rohingya refugees flooding over the border from Myanmar. As the IMF notes: "Despite the high influx of refugees starting in August 2017, the Bangladeshi government continues to keep its borders open and provide assistance to incoming refugees in coordination with humanitarian agencies. The government has so far managed the additional spending with support from the international community. However, given the uncertainties surrounding the repatriation process, the crisis impact on host communities and the rest of the country could intensify. In the near-term, refugee camps face significant risks from floods and landslides during the monsoons, highlighting the urgent need to upgrade infrastructure." The financial sector has its weak spots. Both the World Bank and the IMF point out that tax collections are extremely low. As the IMF writes: "Tax reforms are urgently needed to increase the very low tax revenues. With tax revenues below 10.0 percent of GDP, there is a pressing need to boost collection. This will create room for increased public investment and improved social safety nets, without undermining fiscal sustainability." There is a national election scheduled for December 2018. The opposition doesn't trust the incumbent government to hold a fair election, and the previous election in 2014 was marred by boycotts and violence. The incumbent government doesn't trust the opposition to contest an election in an open and nonviolent manner. Extreme terror is always a threat, as well. Every country and every economy has its troubles. But I think back to when I first paid some attention to the Banglashi economy in the late 1970s, in the aftermath of the terrible famine there in 1974-75. The current problems of Bangladesh are a lot nicer ones to have. Along with moving up from low-income to lower-middle-income status in the World Bank rankings, the United Nations Committee for Development Policy announced in March that Bangladesh had met the requirements to be reclassified from a "Least Developing Country" to a "Developing Country," although it needs to maintain its status on various measures until 2024 before the change officially happens. When market forces of supply and demand become involved with parts of the human body, the result can be a high degree of ambivalence. In the US, for example, a system has evolved where the health care system primarily relies on volunteers for blood, but on paying those who donate blood plasma. Not coincidentally the system of paid US now supplies nearly two-thirds of all the blood plasma available in the world. This pattern is under discussion in Canada, which in recent years has relied on imports of US plasma for 83% of its use. 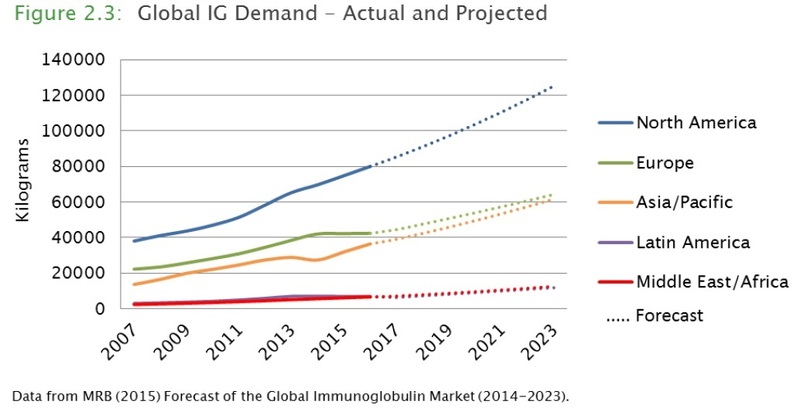 An Expert Panel on Immune Globulin Product Supply and Related Impacts in Canada has recently published a report: Protecting Access to Immune Globulins for Canadians. The report lays out facts and evidence, without taking a specific position on paid donations for plasma. However, a Canadian group called “Ethicists and Economists for Ethical Donation-Compensation Practices” has published an open letter arguing: "Both the ethical and the economic arguments against a compensatory model for blood plasma for further manufacture into PDMPs (hereafter: “the compensatory model”) are weak. Moreover, significant ethical considerations speak in favour of the compensatory model ..."
"Plasma is a yellowish coloured liquid component of blood that normally holds the blood cells in whole blood in suspension. It makes up about 55% of the body's total blood volume (TBV). It is the raw material manufactured into a range of medications used by Canadians both inside and outside the hospital setting. ... Over the years, the use of immune globulins (IG), the most widely used product derived from human plasma, has expanded from the treatment of patients who do not make antibodies to protect themselves from infection (immunodeficiencies) to patients across a broad spectrum of illnesses (hematologic, neurologic, rheumatologic, dermatologic) where it is used as an immune modifier." 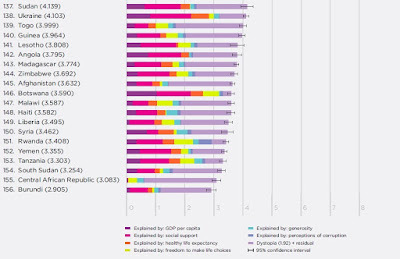 "The only 4 countries that are considered 100% self-sufficient in IG are those that had both voluntary and paid donors as seen in Table 3.2. ... 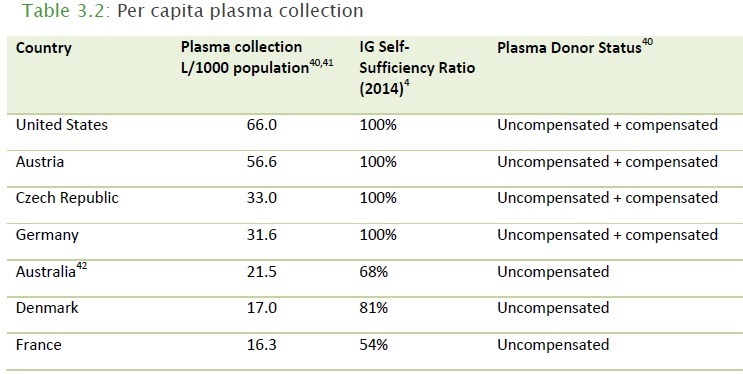 Overall, the US supplies 64% of all plasma collected globally and 74% of all source plasma. 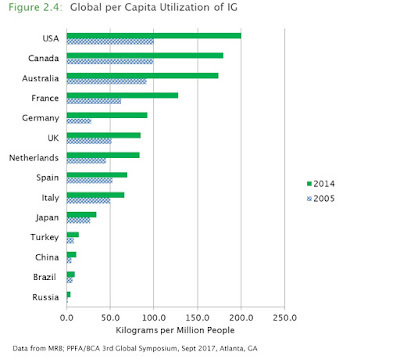 In 2015, the US supplied 83% of the plasma used to make IG and PDPs for Canadian patients. The Panel was unable to find any evidence that saturation of the US plasma collection market (i.e. 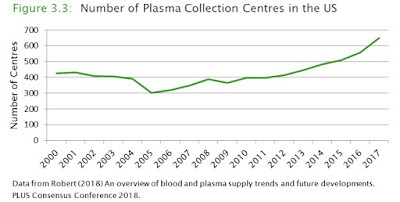 maximum number of plasma donors or source plasma collections has been reached) was a significant risk in the medium term. There were specific geographic regions highlighted in the US where the intensity of plasma collection activity is increasing significantly. In these areas, this concentration of source plasma collection centres drives up competition for plasma donors, which is reflected in the compensation being paid to those donors, however, there were no metrics or evidence submitted to the Panel that suggested that saturation was imminent." There is considerable variation across countries in the use of immunoglobulin products derived from blood plasma The US, with its plentiful supplies and high tech approach to medicine, leads the way. But the substantial rise in use of these products is not just a US phenomenon. 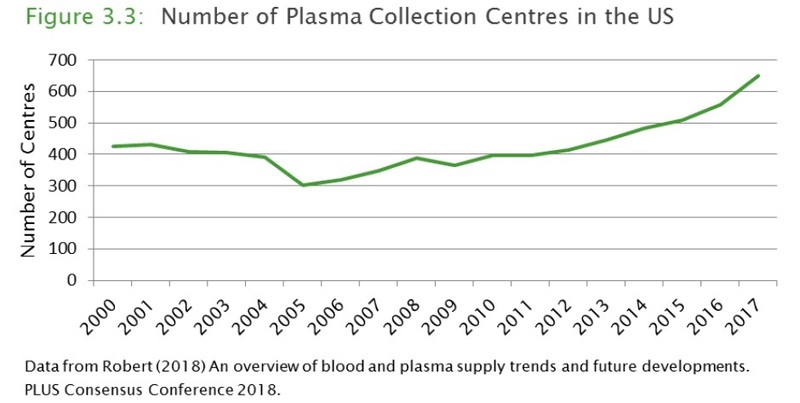 And here's a figure showing hat the number of plasma collection centers in the US is on the rise. In thinking about payment to blood plasma donors, a few issues immediately arise. We don't have a problem in a market economy with paying workers for tasks that are physically exhausting or even tasks that have a degree of risk. But being paid for plasma impose health costs that should be a concern? Also, does paying for plasma raise a risk of attracting unhealthy donor, in a way that might compromise the healthiness of the plasma supply? The Economist describes the process for plasma donation, along with the other isssue, in a couple of articles about paying for plasma in the May 12 issue: a leader called "Lift bans on paying for human-blood plasma: The limited medical and social risks are dwarfed by the benefits" and a longer article called "Bans on paying for human blood distort a vital global market: The market in life-saving blood-plasma products depends on Americans who are paid for it." "The global demand for plasma is growing, and cannot be met through altruistic donations alone. Global plasma exports were worth $126bn in 2016—more than exports of aeroplanes. ... Plasma today is mostly collected via apheresis, a process where whole blood is extracted, spun in a centrifuge, and the plasma is skimmed off. Red blood-cells are then mixed with an anticoagulant and transfused back into the donor. Blood-donation can take just 10-15 minutes. Apheresis usually takes at least an hour. Plasma replenishes more quickly than red blood-cells. So donors can give more at one session, and far more frequently. In most countries whole-blood donors can give around 500ml of blood, which yields just 250ml of plasma, at most once every two months. Plasma donors can give up to 800ml of plasma—and in America are allowed to do so twice a week. This quickly adds up. In a year a plasma donor could give over 80 litres of the stuff, compared with just 1.6 litres from a whole-blood donor." In terms of potential health dangers from plasma, there is now a powerful combination of ways of both testing plasma and treating it. Thus, the Canadian Expert Panel notes: "As noted above, the multiple safety steps and ongoing oversight and surveillance by various agencies have resulted in an impressive safety record for PDPs [plasma derived products] with no confirmed case of transmission of infectious disease by PDPs in over 20 years." One of the responses to the dominance of paying for plasma is to advocate a big push for more donations of blood plasma. I certainly have nothing against a push for more volunteer donations. 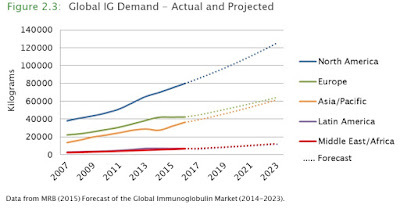 But if (or when) such a push falls dramatically short of the rising demand for immunoglobulins and other plasma-derived products, it seems to me that payment for plasma should be acceptable. The risks to donors are not high, and the methods of monitoring and testing have become quite good. After all, when you think of the chain of companies and health care providers involved in the development, production, and clinical use of immunoglobulins and other plasma-derived products, it's hard for m to see why the plasma donors are expected to be volunteers while all the other parties are being paid for their services. The Canadian Expert Panel notes that the line between "voluntary" and "paid" blood donors seems to be turning into more of a continuum over time, in which various kinds of compensation falling short of cash payments becoming more common. "To further complicate things, over the last 2 decades there has been an evolving continuum of donor compensation, incentives, and rewards in the voluntary donor sector. There is no longer a clear delineation between a “volunteer” donor and a “paid” donor. 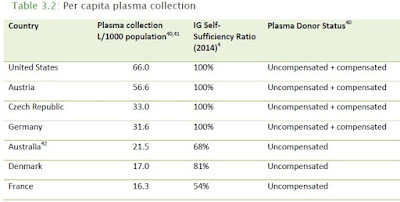 In the global non-profit blood operator community, a wide array of monetary and non-monetary incentives have been developed to recruit and sustain blood and/or plasma donors – these incentives include cash payments, vouchers, discount coupons, gifts, event tickets, health checks, or time off work ... Survey results from 2014 document the variety of monetary and non-monetary incentives in use for volunteer apheresis plasma and/or blood donors in Europe ... . The fixed sums offered to volunteer blood and plasma donors ranged from 16-30 Euros in the countries where donor payment was allowed (Germany, Czech Republic, and Austria), while the Netherlands, offers a 20 Euros incentive to reimburse travel costs to volunteer donors. In addition, of 28 respondent EU countries, 11 offer 1 or 2 full days off work for both blood and plasma donations, yet only 3 of those countries consider these benefits an incentive / payment for the volunteer donor. Some argue that it is incongruous that such high-value practices are not considered forms of payment."